I have recommended the work of Adam Curtis here before. And if you have any hope (Ha! What an optimist you are!) of understanding the Middle East, then you urgently need to read and watch his latest post. It is something of a mystery how Mr Curtis comes to be allowed (and presumably encouraged) to poke around in the BBC archives, but his resulting insights are worth ten of any academic tomes on the subject. More power to his elbow and archive-searching, say I. Some eighty-five years ago, an English novelist by the name of C.S. Forester published the first in a 12-book series about Horatio Hornblower. The books were not written chronologically, in terms of the hero's life, but eventually covered Hornblower's career in the British Navy, from Midshipman to Admiral. The Hornblower books were set in the age of the Napoleonic Wars, and were enormously successful, both in the US and the UK. They were admired by, among others, both Ernest Hemingway and Winston Churchill, and yet could easily be read by the average schoolboy. In 1951 a successful film version appeared, starring Gregory Peck in the lead role. Since then, the idea of a book, and possibly a whole series of books, starring a member of the British Navy in times past, must have been seen by many a publisher and writer as a target worth consideration. Patrick O'Brian began a similar series, with Master and Commander, in 1970. And now David Wesley Hill has taken his turn to have a go. 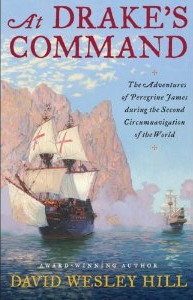 At Drake's Command is set in the late sixteenth century and is subtitled 'The adventures of Peregrine James during the second circumnavigation of the world'. It's just published by the Temurlone Press, where you can read the first chapter, and it's available in trade paperback format through the usual channels. Early reviews are good. The naval-fiction genre is a small one, but there is, surprise, a web site devoted to it. 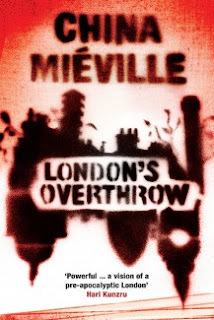 London's Overthrow is a small paperback -- about 7" by 4.5" -- and it runs to about 96 pages, including the prelims and a few photos at the end. The book is printed on paper which, as in a newspaper, allows the reproduction of a number of the author's colour photographs; these are done in what I take to be a deliberately impressionistic style. The publisher is the Westbourne Press. The text began life (in a shorter form) as an article in the New York Times in March 2012. As for China Mieville, who he? Answer, a very distinguished science-fiction writer: he is a three-times winner of the Arthur C. Clarke Award, and has also won the Hugo, World Fantasy and British Science Fiction awards. And what are we to make of it all? The title suggests that London has been overthrown. And if so, by whom? Speaking as someone who lives in the provinces, I can only say that, on the rare occasions when I go there, I am struck by the almost complete lack of Londoners. In a restaurant or a hotel, it is rare to be served by someone whose first language in English. As for Cockneys -- damned if I've seen or heard one for decades. Is that circumstance the same as being overthrown? I don't know. But the character of the place has certainly changed, within my own adult lifetime. Mieville seems to have wandered around this ancient city, poking his nose into obscure as well as famous places, and giving us, not unreasonably, his impressions of what he sees. Inequality is one such feature. Rich and poor. Forty per cent of London's children live in poverty, he tells us. But poverty by what measure, and whose definition? Certainly nothing remotely comparable with the nineteenth century. All these poor children wear shoes, and I would bet good money that the majority of them carry a phone. The picture of London that I get from these pages is of a patchwork of cultures. The Brick Lane mosque, for instance, was formerly a synagogue and before that a church. And Mieville suggests, if I read him aright, that Britain is seeing a mutation of its 'traditional' fascism into a form fixated on these new scapegoats. I don't think I recognise that 'traditional' fascism, though it's an arguable point, I suppose, based on the UK's history of colonies and Empire. The past was indeed pretty vile in some respects. But would we be better off, for instance, with Sharia law? Would our women welcome being forced into arranged marriages, and being chopped into small pieces if they demurred? I hardly think so. This is, I fear, all too realistic an attitude. Speaking for myself, I am at a loss to explain how it is that the UK has not already descended into interracial violence on a massive scale. I speak here not so much of London as of the great industrial cities of the north. The streets where my mother and father grew up are now solidly Asian. For block after block. And what do the displaced working-class Brits make of this? They seem to accept it. 'At least,' said my elderly aunt as I drove her past my grandmother's old house, 'they are maintaining it well.' This, mark you, where groups of Asian youths have recently been convicted of grooming underage white girls for sexual exploitation. What is the explanation for this lack of violence? Only a supreme optimist could put the present calm down to tolerance and goodwill. It is more likely, I fear, that the educated middle class have given up hope. Everywhere they look there is incurable corruption or incompetence: politics, science, education. As for the banks and big business... Well, words fail. And that's before we even begin to think about the potential of a Eurozone crash wiping out the world's financial system. And the young -- the ones who might initiate some sort of change -- they seem to live in a state of fugue, made senseless by street drugs, deafening music and the distractions of technology. Less than fifty years ago, a government-appointed committee, led by Lord Robbins, considered the purposes of higher education, and listed as one of the four most important 'the transmission of a common culture'. The four aims laid down by Robbins were accepted by the government and were built into the Charters of several of the new universities that were created in the 1960s. But what was 'a common culture'? Did anyone ever know? What are its characteristics? Fair play, honesty, truthfulness...? Well, if we ever had a common culture, I suggest that our policies on immigration and taxation, to name only a couple, have successfully destroyed it. I do hope that was an accidental result. In 2012, 1 in 4 of the babies born in the UK are to foreign mothers; and in London the number is 6 out of 10. As usual in his books, Mr Mieville belabours us with long and obscure words; it is a characteristic of his style: tchotchkes, hecatomb, gnosis, quotidian, nonnatives... I have a pretty fair idea of what they mean, or can guess from the context, but these are not words in most people's everyday vocabulary, and I'm not sure that communication is improved by their use here. The price of this book is £5.99 on Amazon and £7.99 as listed by the publisher. If you seek food for thought, it is here aplenty. But don't blame me if you end up feeling a bit queasy.